The next BID breakfast event takes place on Wednesday 29th May at The Bedford Centre Hotel (formerly the Raddison Park Inn) at 7.30am. To register your interest please contact Karen at karen@lovebedford.co.uk. The September BedfordBID Breakfast included a fascinating fact file on footfall in the town centre. 1,000 visitors were professionally polled in July (300 in Harpur Centre, 700 on-street locations) on their demographics and spending habits, as well as their views of businesses and how likely they would be a recommend the town to friends and family. “Bedford bucks the national trend for the number of visitors by footfall time and time again, especially when there are fun events going on like the Love Bedford Sunday. “We know that people like positive news PR stories about the town and they read these in the local Press, but critically of course the younger audience are more influenced by social media. Our Instagram-led video campaign over the summer has been in response to that - the messages are the same: Bedford’s a great place to shop and eat. Conducted by Shopper Anonymous, the Net Promoter Survey will be carried out again in December by which time the impact of Riverside Bedford and Rushden Lakes may be evident. 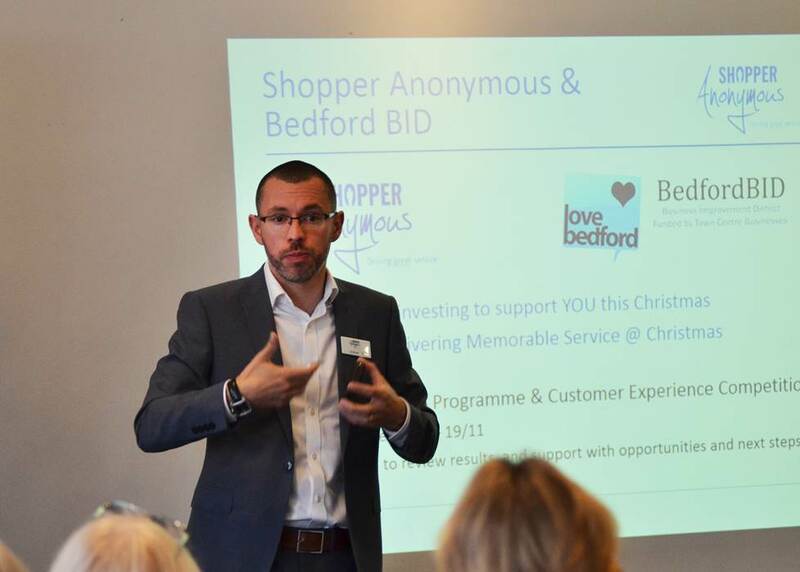 Bedford Business Improvement District (BID) is the ONLY market town to have undertaken this type of survey, which is normally used by big brands like John Lewis. In addition, the successful Customer Service campaign run last year is being repeated. 30 BID businesses can have a free training day and then follow up secret shopper visits to give feedback. “We know that this impacts on the visitor experience and raises the bar for customer service in the town overall,” said Christina. Meanwhile, the Healthy High Streets project to improve investment in the trading environment is underway. Projects include raising the quality of Bedford markets to bring them up the super standards which are already on offer on some stalls. Boots nationally is supporting the Healthy High Streets campaign and locally it is working the the Bedford Business Improvement District (BID) to raise aspirations for the town. The guest speaker for the event was Joe Nellis Professor of Global Economy at Cranfield University. He told the audience not to believe forecasts by either side because the situation created by the referendum on June 23rd had never before existed. He then went on to go through argument for and against voting to Remain or Leave.